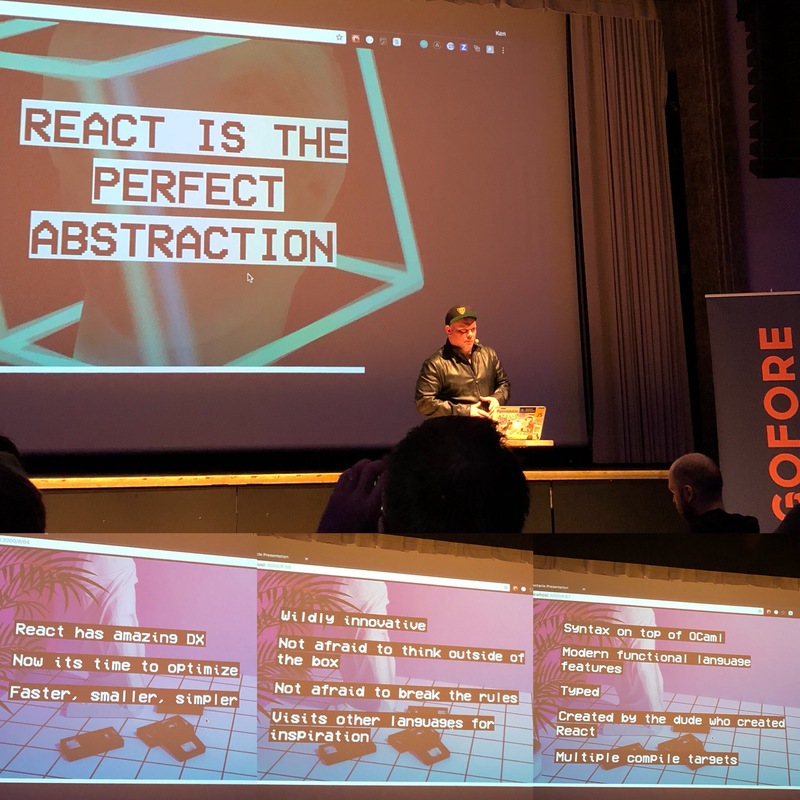 React Finland 2018 conference was held last week and I had the opportunity to attend it and listen what’s hot in the React world. The conference started with workshops and after that there was two days of talks of React, React Native, React VR and all things that go with developing web applications with them. The two conference days were packed with great talks and new information. This is the second part of my recap of the talks and my notes which I posted to Twitter. Check out also the first part of my notes from the first day’s talks. 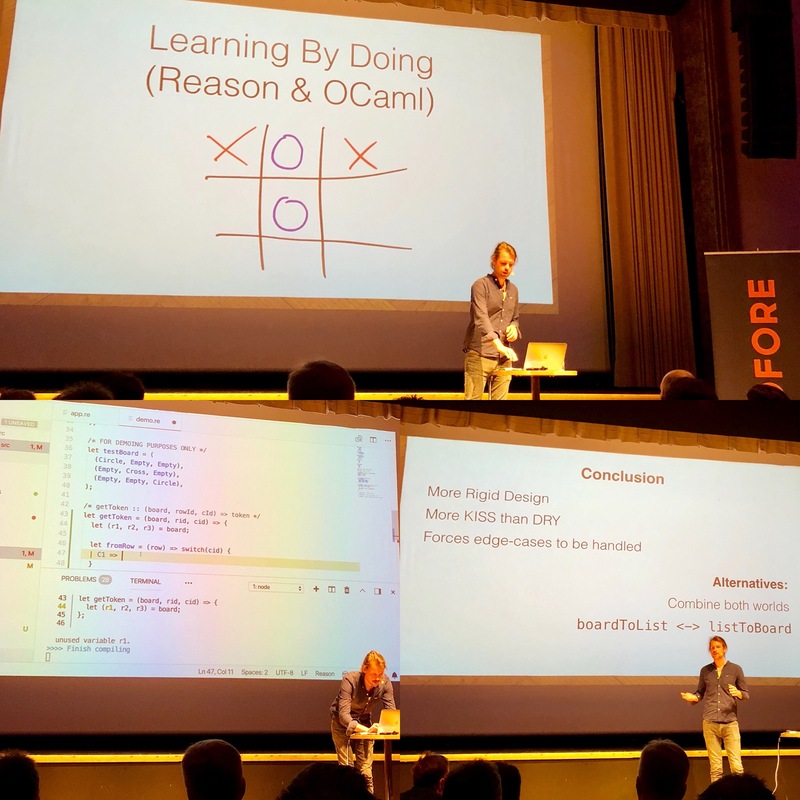 The keynote also touched Reason ML and Nik Graf went into details kicking off with the basics and going into how to leverage features like variant types and pattern matching to make impossible states impossible. Based on “Get started with Reason” Patrick Stapfer’s talk went deeper into the world of variant types and pattern matching and put them into a practical context. The talk was nice learning by doing TicTacToe live coding. It showed how Reason ML helps you design solid APIs, which are impossible to misuse by consumers. 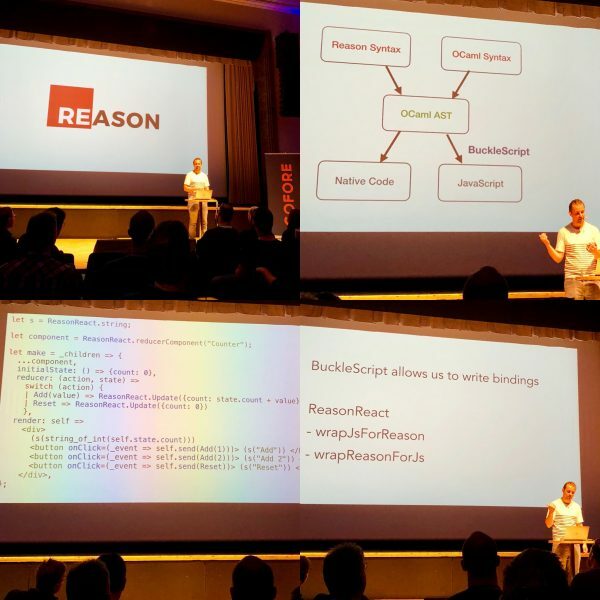 We also got more insights into practical ReasonReact code. Presentation is available on the Internet. David Khourshid’s talk about state machines and statecharts was interesting. Functional + reactive approach to state machines can make it much easier to understand, visualize, implement and automatically create tests for complex user interfaces and flows. Model the code and automatically generate exhaustive tests for every possible permutation of the code. Things mentioned: React automata, xstate. Slides are available on the Internet. The talk was surprisingly interesting especially for use cases as anything to make testing better is good. This might be something to look into. After theory heavy presentations we got into more visual stuff: React VR. 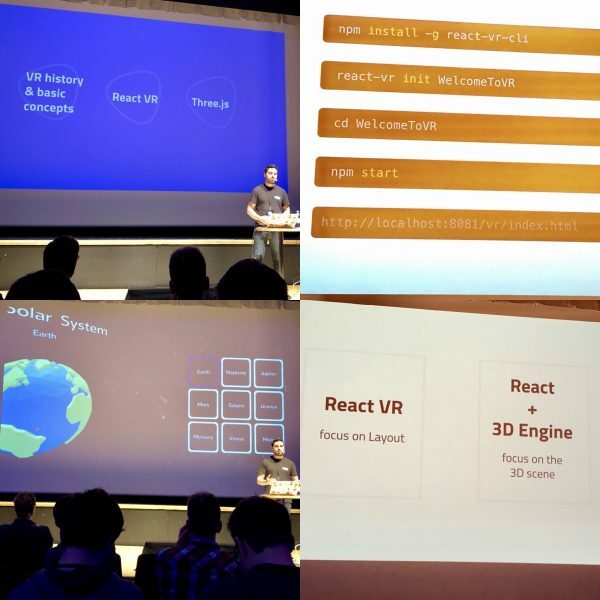 Shay Keinan presented the core concepts behind VR, showed different demonstrations, and how to get started with React VR and how to add new features from the Three.js library. React VR: Three.js + React Native = 360 and VR content. On the VR device side it was mentioned that Oculus Go, HTC Vive Focus are the big step to Virtual Reality. WebVR enables web developers to create frictionless, immersive experiences and we got to see Solar demo and Three VR demo which were lit ?. 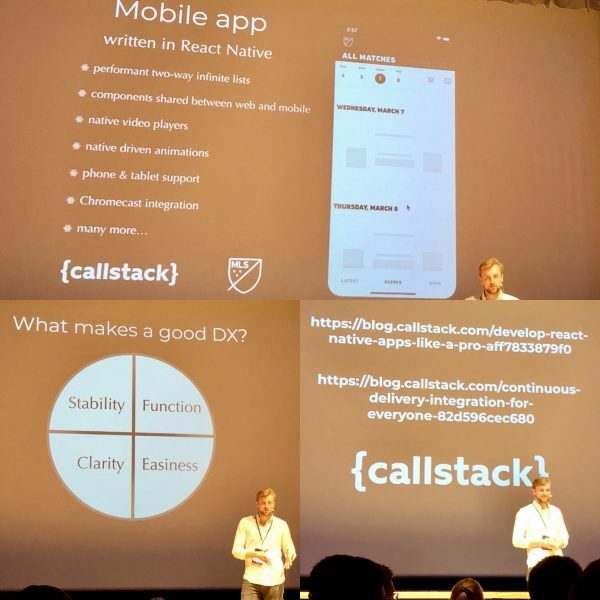 I’ve shortly experimented with React Native so it was nice to listen Michał Chudziak’s talk how to set up a friendly React Native development environment with the best DX, spot bugs in early stage and deliver continuous builds to QA. Again Redux was dropped in favour of apollo-link-state. What makes a good Developer eXperience? GraphQL was mentioned to be the holy grail of frontend development and perfect with React Native. Tools for better developer experience: Haul, CircleCI, Fastlane, ESLint, Flow, Jest, Danger, Detox. Other tips were i.a to use native IDEs (XCode, Android Studio) as it helps debugging. XCode Instruments helps debug performance (check iTunes for video) and there’s also Android Profiler. 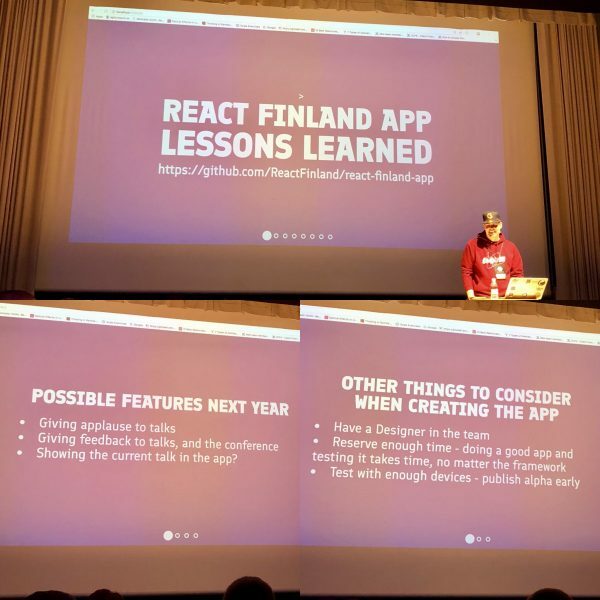 Every conference has to have an app and React Finland of course did a React Native app. Toni Ristola lightning talked about lessons learned. Technologies used with React Native was Ignite, GraphQL and Apollo Client ? App’s source code is available on GitHub. 80% of mobile app development is the same old song which can be cut short with Ignite CLI. 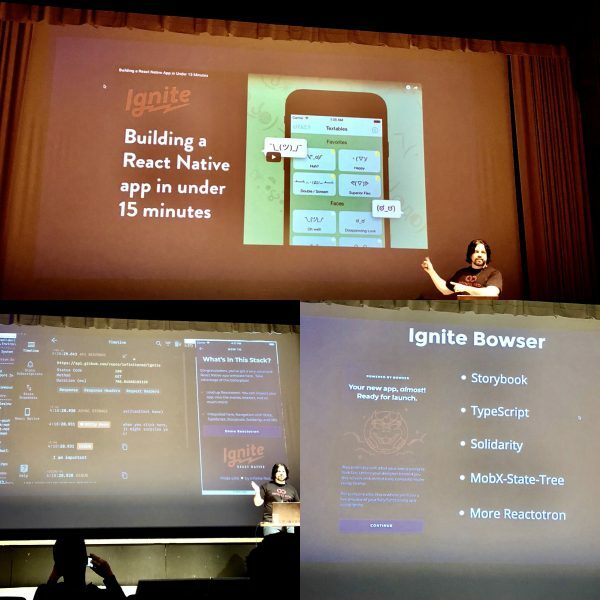 Using Ignite, you can jump into React Native development with a popular combination of technologies, OR brew your own. Gant Laborde talked about the new Bowser version which makes things even better with Storybook, Typescript, Solidarity, mobx-state-tree and lint-staged. Slides can be found on the Internet. Varya Stepanova’s lightning talk suggested to start a side-project other than ToDo app to study new development approaches and showed what it can be in React. The example was how to generate a multilingual static website using Metalsmith, React and other modern technologies and tools which she uses to build her personal blog. Slides can be found on the Internet. Doing meaningful side-projects is a great idea to study new things and I’ve used that for i.a. learning Swift with Highkara newsreader, did couple of apps for Sailfish OS and played with GraphQL and microservices while developing app with largish vehicle dataset. Two days full of talks of React, React Native, React VR and all the things that go with developing web applications with them was great experience. Days were packed with great talks, new information and everything went smoothly. The conference was nicely organized, food was good and participants got soft hoodies to go with the Allas Sea Pool ticket. The talks were all great but especially “World Class experience with React Native” and “React Native Ignite” gave new inspiration to write some app. Also “ReactVR” seemed interesting although I think Augmented Reality will be bigger thing than Virtual Reality. It was nice to hear from “The New Best Practices” talk that there really is no new best practices as the old ones still work. Just use them! Something to try and even to take into production will be Immer, styled components and Next.js. One thing which is easy to implement is to start using lint-staged although we are linting all the things already. One of the conference organizers and speaker, Juho Vepsäläinen, wrote Lessons Learned from the conference and many of the points he mentions are to the point. The food was nice but “there wasn’t anything substantial for the afternoon break”. There wasn’t anything to eat after lunch but luckily I had own snacks. Vepsäläinen also mentions that “there was sometimes too much time between the presentations” but I think the longer breaks between some presentations were nice for having a quick stroll outside and have some fresh air. The venue was quite warm and the air wasn’t so good in the afternoon. The Afterparty at Sea Life Helsinki was interesting choice and it worked nicely although there wasn’t so many people there. The aquarium was fishy experience and provided also some other content than refreshments. Too bad I hadn’t have time to go and check the Allas Sea Pool which we got a free ticket. Maybe next time. Thanks to the conference crew for such a good event and of course to my fellow Goforeans which attended it and had a great time!